At our GitHub pages, we added examples of the individual controls – checkboxes, radio buttons, plots, etc. – that we use in our Web Lab simulations. These examples are easier to read and understand than controls embedded in a complete simulation. In addition, all of our Web Lab source code can be viewed in your web browser by viewing the page source. This entry was posted in HTML5, Software Development, Web Labs on December 1, 2017 by Richard Herz. We have been working on our web page design project, lcCardLayoutToWeb, which is posted at GitHub. Here is a screenshot of a test page. This new work should allow us to make interactive web apps more easily. See our newest Web Lab, “Dynamic diffusion and reaction in a porous solid catalyst” at the Web Labs tab above. See the latest version of this web lab in our open-source projects at GitHub, https://github.com/RichardHerz/. This entry was posted in HTML5, Interactive Learning, Web Labs on June 13, 2017 by Richard Herz. In an earlier post, we mentioned the web apps being developed by Tony Butterfield. His web apps have a different structure than ours, and it is interesting to compare these two approaches. You can view the source code of the web apps by choosing View Source in your web browser. Butterfield’s web apps have a single method that updates the state of the simulation at each time step, vs. our process unit objects, each of which contain a method to update themselves at each time step. For plotting, his web apps record variables values at each time step in each variable object, vs. our 3D numeric array that records the history of all variable values, with individual process objects storing only their current values. Both approaches work, and it is valuable to have a choice for web app development. This entry was posted in HTML5, Software Development, Web Labs on November 24, 2016 by Richard Herz. The goal of our Web Labs is a toolbox that enables development of interactive web simulations or “labs,” and a set of labs built with this toolbox. Our development practice is as follows. First, Get something up on the screen. Often this involves finding an example on the web and modifying it. Don’t spend a lot of time designing and thinking before something simple gets running. We believe that it is better to get something useful running than it is to have a beautiful plan and theory in development but nothing working to show for your time. As we observe repetition of code and see patterns developing, generalize the code. Have the objective of maximizing code in libraries and minimizing code needed to build new labs. As we observe patterns developing in the user interfaces, refine the design of a user interface guideline that is simple and consistent between labs in order to speed development of new labs and speed user comprehension when entering new labs. This entry was posted in HTML5, Software Development, Web Labs on November 5, 2016 by Richard Herz. 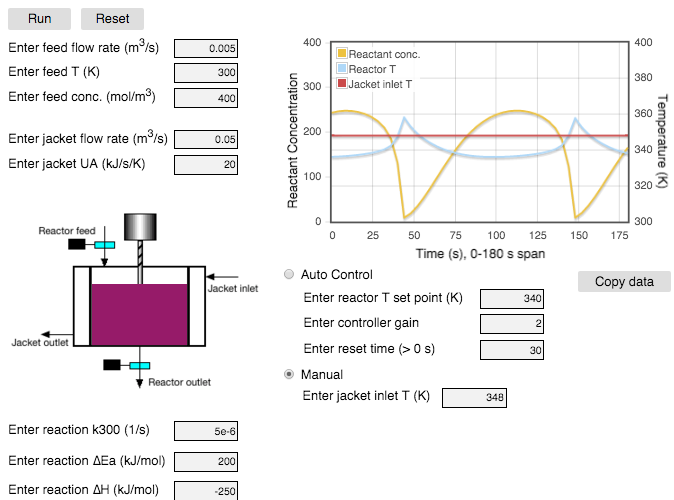 Web app experiment 3 demonstrates feedback control of temperature during reaction in a continuous stirred tank reactor (CSTR). See the Resources tab, Web app experiments. Below is a static screenshot – click to enlarge. At default conditions in manual control mode with constant inputs, the system oscillates. Do you know why the system oscillates? See the Resources tab, CRE Notes, 15 – CSTR thermal effects. Then put the system into Auto Control mode. This entry was posted in Chemical Reaction Engineering, Dynamics, HTML5 on January 5, 2016 by Richard Herz. The architecture we are using is that of separate code objects, representing separate process units, which send messages to each other. This architecture allows us to change a simulation easily by adding or subtracting units from a system model. These dynamic simulations solve a set of coupled, first-order, ordinary differential equations. This type of system is termed an “initial value problem.” The solution method is stepping in time (the independent variable here) using the Euler method. 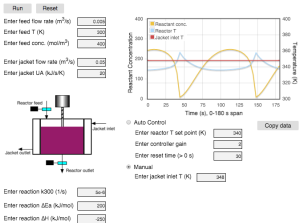 The Euler method has inherent numerical errors, as do other numerical methods, but the solutions can be corrected to approach the exact solution, as we have done in several labs in the desktop Reactor Lab. This entry was posted in HTML5 on January 3, 2016 by Richard Herz.